Technology companies love to over complicate things. They can never use a short word when a sesquipedalianism is available. The same goes for meetings. Instead of talking on a landline, they all insist we listen to them throwing out random thoughts via their handsfree system as they drive along a motorway. Or worse – this happened the other day – as they sit in an airport lounge on the start of their holidays. Now SD WAN (software defined wide area networking) is the latest over hyped technology to enter the Tragic Quadrant of products that – I sometimes suspect - only analysts can get excited about. IDC predicted that SD WAN would be an $8 billion global market by 2020. Now Gartner is saying that 93% of enterprises plan to use SD-WAN, but only between one and five per cent of them have dared to use it. If true, there’s a massive potential difference between demand and supply. You can practically feel the static electricity. Clearly there would be a massive opportunity for resellers, systems integrators and service providers to step into the breach. All you need to do is provide a connection and boom, you’ll be charging your customers handsomely. However, getting all the elements together in an SD-WAN is a lot harder than people think. This is because of the complexity of the choice they face. There are so many variable to consider, such as the numbers of SD-WAN customers that a service provider may be supporting in your region already. Overstretching was the death of the ASP supplier. Could SD-WAN suffer the same fate? Not all companies have the right culture to tackle SD WAN- which is as complicated as open source gets. You need a dev ops mindset and the determination to keep on top of changes. A company that works in IT security services, for example, is less likely to be open to change because there are rigid procedures that need to be followed. In a software defined world, the only limits to your possibilities are either the hardware or the proprietorial attitudes of the service provider. This is where a simulation on Open Labs (Orange’s lab testing service) can make you aware of the possible drawbacks. Not all service providers will have the technology and service levels to match each company’s needs. When Siemens began the software definition of its networking, first locally and then across the wide area, two of its three objectives were to cut costs and to boost bandwidth. An enterprise like Siemens can have internet and telecom contracts running into the hundreds, each with remarkably different service level agreements (SLAs) governed by different levels of monitoring and management. Orange Business managed to pull this off, but this is one of the few with the resources to cover all eventualities. However, creating an in-house team to tackle SD WAN will be a major challenge, so service providers can help enterprises to by-pass this complexity by enabling a service integrator to take over the management of the contracts, while the enterprises remain owner of sourcing and contract management. WANs have been complicated by the cloud, mobile working, endpoint technologies and the options for connectivity, such as MPLS, public Internet and 4G. 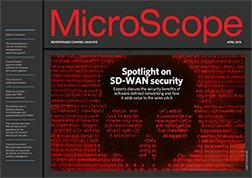 “SD-WAN means businesses could impose a control layer over these different physical networks and components and do smart things like control the WAN from a central location, get better network overviews, set up local offices and route different traffic across networks,” says Marc Sollars, CTO of Teneo. Sensitive data could go across MPLS while the harmless stuff could travel across the public Internet. Not everyone is impressed though. “From my point of view, SD-WAN is a load of marketing spiel,” says Justin Day, MD of 6Point6. One rebellious analyst actually spoke out against the hype. “SD WAN is still at an early stage of its maturity,” says Clive Longbottom, senior researcher at Quocirca. Though it promises much, it needs to align itself with the more mature software-defined entities, such as networks. “If SD-WAN creates a new set of standards and divides the market, it could find itself sidelined in a market that can fall back on proven firmware-based approaches,” says Longbottom. Still, it’s an $8 billion market, if you believe the analysts.